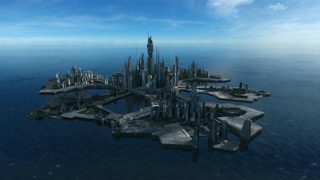 It’s a typical Sunday in the city of Atlantis, as Dr. Elizabeth Weir and her people go about their everyday business. A handsome young scientist, Mike Branton, finds Elizabeth at work in her office on her day off. Mike is obviously smitten with the expedition’s leader, and is fighting an uphill battle when he tries to convince her to go to lunch with him. Elizabeth has a personal rule against dating people under her, but Mike persuades her that there’s nothing wrong with eating lunch at the same table. During their “not a date” the charming man begins to wear down her shields, and even kisses her. She seems attracted to him, but decides she can’t allow a potential romance to bloom. She’s saved from the awkward situation when the control tower radios her: There has been an explosion in the city. Three people are dead and more are injured, and they believe it may have been a bomb. “There’s an episode that I want to do but it’s not really a Stargate episode. But I feel like it doesn’t really belong — I’d love to do a Stargate episode that has no jeopardy at all, that is just a Sunday afternoon, essentially, kind of speaking to that off-duty thing, and in vignettes about each character in their off time. Basically five short films about each character. But I’ll probably never do it, to be honest. “That’s going to be an awfully good episode and one that every fan needs to watch. I don’t think I should say much more than that. “Part of me likes this story a great deal, while part of me was challenged significantly by it because essentially it’s a day off for our people, and the truth is, drama is driven by everyday things we have to do. It’s that urgency that drives drama, but when you have a day off, by its definition there is literally no urgency. 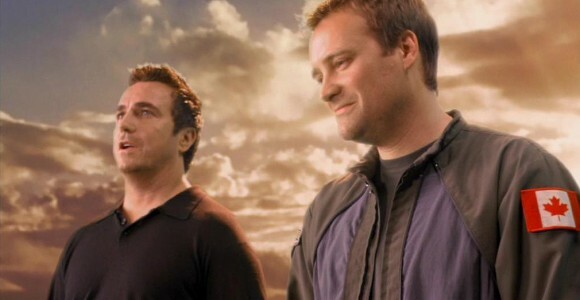 For ‘Sunday’ we shot these scenes that felt a little bizarre because Sheppard and the others are dressed in their civilian clothes and hanging out, making small talk, drinking beer, playing golf, etc., and generally goofing off. VOTE! How would you rate Atlantis's "Sunday?"